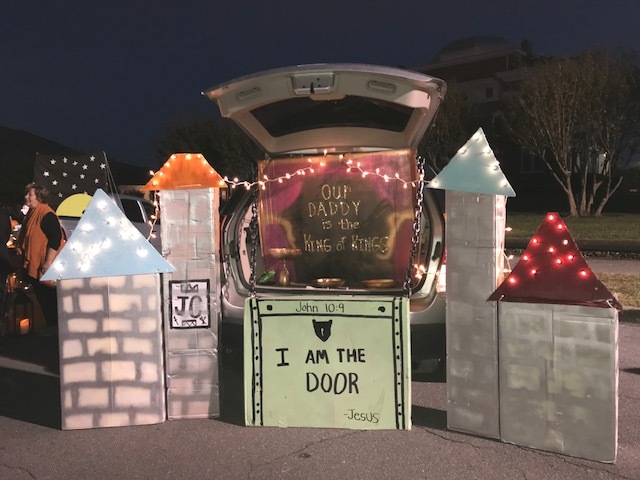 VBS is planned or completed and your mind is dreaming about the next big church activity - Trunk or Treat! Decorating the back of a car is challenging. You definitely want something fun that the kids will love and maybe entertain adults too. Good news! I have the perfect idea for you. This idea just hit me out of nowhere last year. It was a HUGE success. I love Disney! Kids love Disney! My 2015 theme was Alice in Wonderland. Please click the link for another cool trunk idea. 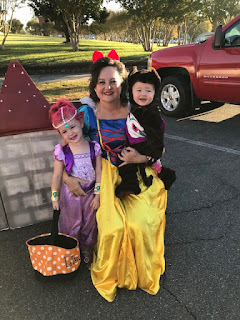 My mind turned to Princesses this year. 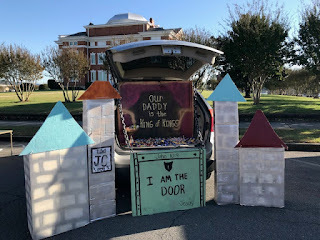 How does a princess relate to a church trunk or treat theme? 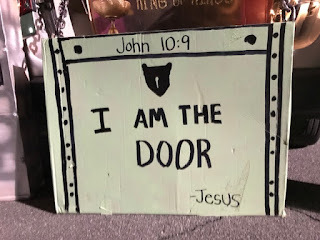 Jesus is the King of Kings, therefore, being his daughter, I'm a princess. 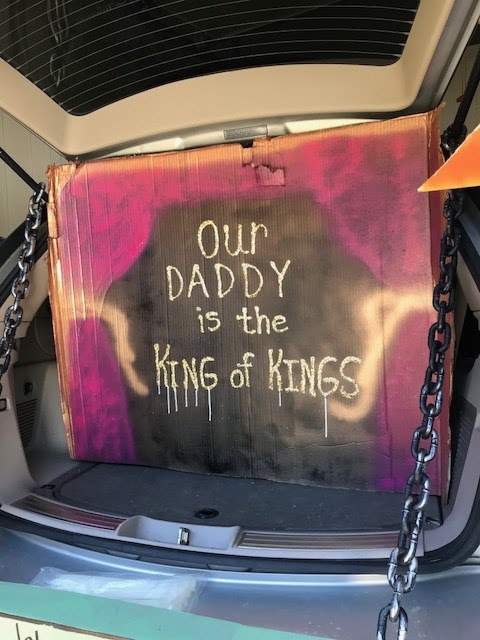 My Daddy is the King of Kings. How cool! This idea works best in an SUV type vehicle. I started in my garage. Use two square cardboard boxes and two tall rectangular boxes to fashion a castle tower as pictured above. I spray painted the front and sides white and then used silver to spray paint the brick look. Do this free-handed as you want the brick to look old and imperfect. If the paint runs, it only adds character! Take one of your extra square boxes and cut out the turrets to match your box sizes. Fasten the turrets to your boxes using wire ties. I put one through the front and on each side. They were quite sturdy for transport to the church. Cut two large pieces to fit the back back of your vehicle like the pictures. Ideally, the trunk resembles a drawbridge door. I attached the chains to my hatch at the top and the "I am the Door drawbridge" at the bottom with wire ties. The drawbridge is drawn and written with black wide tip marker. 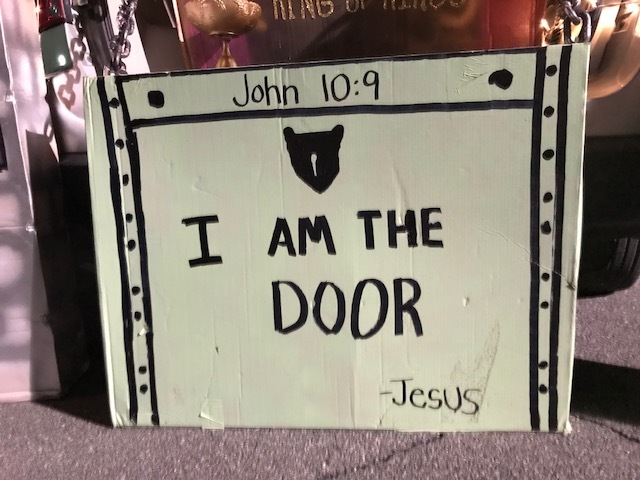 I spray painted the "King of Kings" sign to resemble the inside of the castle with curtains like so. Then I wrote "Our Daddy is the King of Kings" in Elmer's glue and glittered. This sign is simply stuffed inside the hatchback, no mounting needed. 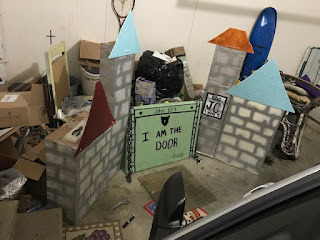 I loaded all my pieces into the car and setup at the church parking lot. The weather was perfect. I didn't have any problem with the boxes standing up without being weighted. If you expect bad weather or wind, try placing a large rock inside each box for stability. After setup, we strung the lights. Using scissors, we punctured holes in the boxes to insert the lights (see picture below). Use the car converter to power the lights once it is dark. Notice the three gold dishes sitting in the trunk. Pour your candy here. The finishing touch is the costumes. 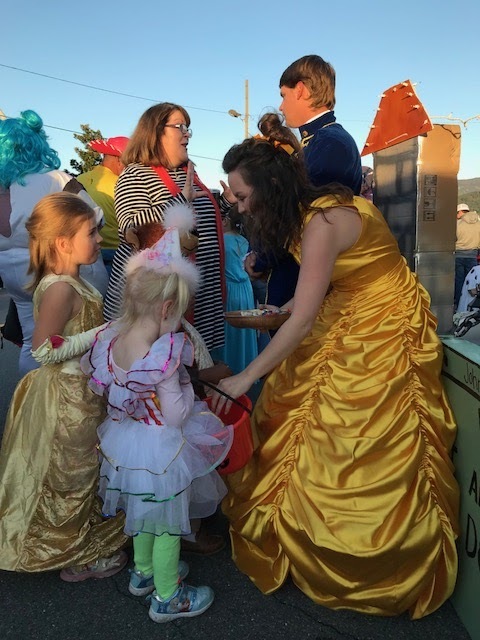 Kids and adults had so much fun meeting the prince and princesses! Such a fun night for Jesus! I took a stool to sit beside the trunk to greet kids and for pictures. 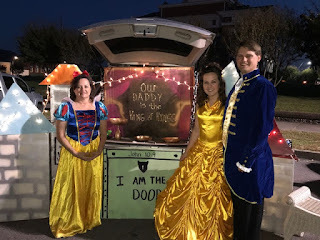 Most of the kids want their picture with the beautiful Belle and handsome prince! I hope you are inspired by this trunk idea. I estimate the cost to create the trunk at $150-$175 if you buy all the items. Please feel free to ask any questions via comment about details I may have overlooked or failed to include. Have fun!